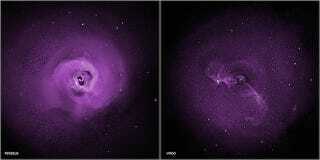 Galaxy clusters are large clouds of hot gas, seemingly-ideal places to observe gas cooling and condensing into stars. Yet, we don't see that happening. Here's a look at how black holes and turbulence are conspiring to keep galaxy clusters underpopulated with hot new stars. Galaxy clusters are behemoths — a single cluster can hold hundreds of thousands of galaxies, with each galaxy containing huge populations of stars. The galaxies swim in seas of hot gas that glow brightly in X-ray light. It would make sense to see the centers of these clusters cooling over time, the gas condensing into stars in an epic stellar nursery. Yet, that's not what we see when we look out at our universe, instead observing the gas staying too hot for stellar formation. Previously, researchers spotted that the jets from supermassive black holes drove vast voids into clouds of dust. Now, new observations of Perseus and Virgo from the Chandra X-ray Observatory peeked into what exactly was happening along the interface between void and gas, identifying turbulence throwing gas into chaos. That turbulence may be enough to keep the gas and postpone star formation for billions of years. The current theory is that the powerful jets of black holes are blasting voids and churning up gas, imparting energy that heats the rest of the cloud and counters cooling. In effect, black holes are stellar birth control for galaxy clusters, keeping the gas from cooling and condensing in a massive population boom of hot new stars. Read more about the research in Turbulent Heating in Galaxy Clusters Brightest in X-rays, and check out an animation here.